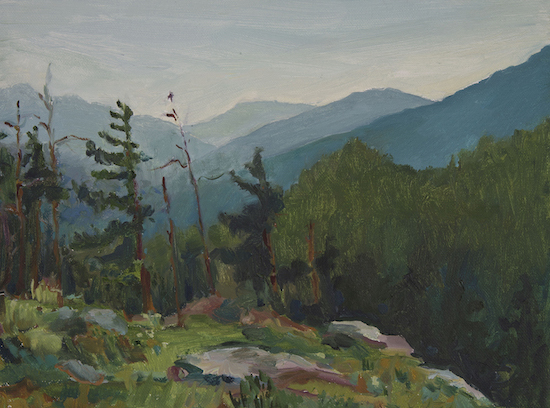 For the past several years, my work has concentrated on themes inspired by the Adirondack Mountains. I use paths of light and water to bring order out of what at first seems a chaotic landscape. As in Wallace Steven’s poem, Anecdote to a Jar, these elements, recently joined by figures, become focal points around which the painted landscape coalesces. Places resonate. As I sit and draw, order becomes clearer. To paraphrase the Scottish painter Joan Eardley, the more I see, the more there is to paint. Watercolors have been my art medium for most of my life although, when younger, I tried out acrylics and oils. I turned exclusively to watercolor painting when I had young children and time for painting was limited, often interrupted. 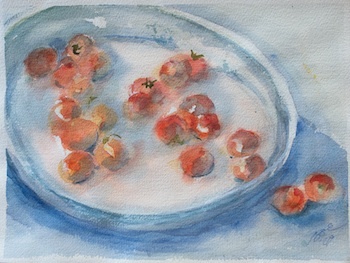 Watercolor paints are non-toxic, easy to clean up and require relatively little equipment, all practical advantages, but I soon came to recognize the unique aesthetic qualities water color painting offers expressive work, among them: freshness, transparency and spontaneity. 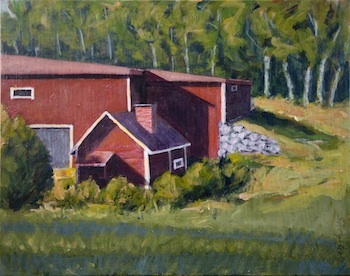 In Seija’s childhood the world consisted of the fields surrounding her home, the nearby forests and lake. Her family’s dairy farm was like all the other farms of that era. Work was life’s meaning and it filled the days – summers in the fields, winters in the forest, and every day the cows.